Mom made doubles! when she came to visit in Guyana. Yay! Of course we were all a bit skeptical because my mother never made real doubles in our life…she turns up her nose at the street bara which are made with ONLY flour and are therefore thin and insubstantial. Her “doubles” used healthier bara made with ground dhal and highly seasoned – more like a kachorie – try wrapping something that thick and solid around anything. We used to try our best to balance the channa on the round bara and get it into the indentations. But this, this is real bara – she didn’t add anything, just, flour, water, turmeric, salt etc, and yeast. Recipe Notes – You can make bara using ground split peas/split peas flour, but I don’t think the doubles man on the street does that – the bara is just too limp to have anything but flour. And channa for street doubles is not normally curried (in the traditional Trini sense), but rather boiled until soft and runny with all the seasonings – this is the easiest way to get the channa for bulk street sales. And I can tell you that the recipes here, tasted authentic enough Everyone has their own version, and most people prefer to buy it on the street anyway! 1. Mix well and knead until it becomes a soft dough. 2. 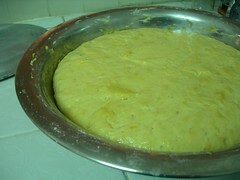 Smooth over with oil or water and allow to rest until dough has risen to about double. 3. Heat oil at least 2 inches deep in a heavy pot. 4. Break off pieces of dough about the size of golf balls (or a little bigger). 5. Stretch out into rounds about the size of the palm of your handand place gently in oil. 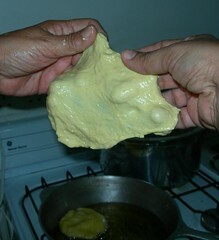 Wet or oil your hands to make this job easier, as this is a very sticky stretchy dough. 6. Turn over as soon as it starts to swell. Take out when it is puffy and golden. 1. Soak the dried channa overnight (24 hours), changing the water at least twice (if using tinned channa, rinse very very well). 2. Put channa in a pot/pressure cooker and cover with fresh water, about 2 inches above the level of the peas (less if using a pressure cooker). 3. Add the seasonings and bring to a boil. Cook until the channa is very soft. There must still be liquid in the pot, so don’t let it dry out. 1. Boil the channa with salt, garlic, pepper and turmeric until soft, but not too much liquid. 2. Saute one thinly sliced onion in oil until golden. 3. Add a tablespoon of curry powder to the onions. 4. Add the cooked channa, stir well. Add other seasonings, stir and cover for about 10 minutes. 5. Add some water and let the channa cook to a nice soft mushy consistency, tasting for seasonings. Assemble the doubles by laying out 2 baras overlapping each other at the ends (on paper or a plate) and top with a spoon of channa. Top that with your choice of hot pepper sauce, chutneys whether chadon beni/bandhania, tamarind, cucumber, mango or coconut. If on paper, wrap it up like the picture or eat it the way I do, using one bara to scoop up half the filling and repeat. My Doubles set on Flickr. P.S. I found that website I mentioned earlier where someone had left a comment that the doubles he eaten were made with BAKED bara! Read to the end, after the recipe! And I still wish that I could respond to that person…but maybe he asked the doublesmen in Piarco and found out the truth. There’s always hope. Addition: Marsha tried making the bara as she mentioned in her comment, so go see how she fared. Of course, she’s no different from me in that she tweaks recipes from the word go 😀 cooking is indeed fun! This entry was written by Chennette and posted on December 30, 2006 at 11:38 pm and filed under food, photos, recipes, Trinidad and Tobago. Bookmark the permalink. Follow any comments here with the RSS feed for this post. Post a comment or leave a trackback: Trackback URL. WHY OH WHY DID I CLICK ON THIS BEFORE GOING TO BED???? OH THE TUMMY GRUMBLING!! DE TUMMY GRUMBLIN!!!! true – but I wasn’t commenting on the channa that WAS cooked, especially since sister, the elder says it was because my channa was petrified from age! what you doing still up? i have to blog about you! @ Lilandra – It’s time to get up for ‘Id ul Adha salaah! Id Mubarak!! Who said I was sleeping? I didn’t think YOU had been sleeping; I was explaining that I just woke up! I was good and slept…for all of 3 hours. I still have …I’m still working on same batch! I find this Global Voices person real reading Chennette blog! look, ah have a small audience, doh chase away my readers! Chennette, doubles is one of the things I can’t make to save my life….actually it’s the bara I can’t make. I’ve tried before but it always comes out like fry bake. That global voices thing is a trackback. In some blogs they have trackbacks and comments separate. In wordpress, I guess it appears as a comment. All it means is that Georgia mentioned you on the Global Voices Online website. By the way, Lilandra I like your new theme….the red layout gave my eyes a workout, lol. Well, I lonely, TriniGourmet have plenty visitors. Sigh…there’s a blank comment up above. I swear i had all of it filled in about how Lilandra and TriniGourmet know good and well what pings are, they just want to chase away my readership…sigh…perils of blogging in airports! Hehehe! GOod thing you didn’t say it you bad girl. steupz i know how to make my own theme!! Thank you, thank you, thank you. I live in Canada and left Trinidad when I was fourteen. 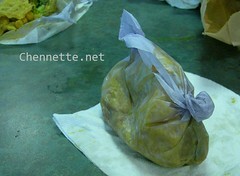 I miss the food of Trinidad sooooo much. 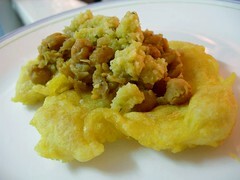 We do have really good Trini restaurants here but sometimes you want to make doubles at home. This is the first time I have seen pictures of the doubles actually being made. Thank your mom for the recipe! welcome Helen – and I’ll pass on the thanks! Mom is very cooperative now when cooking, pausing for photos etc Good luck!! Thanks to Mani for for clearing up the confusion over the Global Voices trackback! For those who aren’t familiar with it, Global Voices is a web site which keeps an eye on the “conversations” taking place in blogospheres throughout the world. I keep an eye on the Caribbean region. Come on over and check us out: http://www.globalvoicesonline.org! Georgia – no stress, there was no confusion, not of the real kind anyway I have been visiting Global Voices from time to time. WE TRAP DE MANICOU!!!!! LOLZ!!!! Trini, can manicou be kosher? Maybe we should have a cook up? I am trying this today. When I post I will make sure to give you credit for all the helpful hints! great Good Luck and I will check for your post! Are the hojaldres sweet or savoury? Hi Angel – glad to know the recipe turned out even in Poland! I decided to mek some doubles ..
it was cripsy so I added more water and oil but still it ent come as soft as de doubles man own?? Whey did I go wrong?? Disappointed but ah go try again … Toronto Canada represent!!! – If you added enough yeast and baking powder, maybe you could let it rise a bit longer – or lessen the baking powder, but definitely let it rise longer. 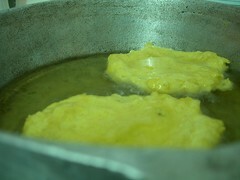 – Keep the bara fairly thin so it fries and cooks quickly and you can take it out of the oil before it gets brown. You just want it cooked and golden, brown will make it crispy or hard. – Try keeping the heat a bit lower also maybe? – Keep swishing some oil over the bara while it puffs up so it can cook faster and you get it out faster while it’s still soft. – When you’re done, keep them stacked up and under a towel or in a cooler/closed container like the doubles man so they keep moist, steamy and soften up. Even hot pholourie is crispy just out of the oil. Hope some of these tips can work out. Let me know. And shout out to Toronto!! Yay! So glad it came out. Cold places up north less humid than down in the Caribbean, so sometimes you do need to add more liquid. And you’re welcome for the pictures 😉 glad to see they inspired someone – spread the Trini food around. ooh, nice 😀 glad it worked out for you – you know the last time I made the bara, so many had holes. Sigh. Working on the technique, but yeah, the flavours you can get, not mention the peace of mind, when you make doubles yourself can be great. p.s. 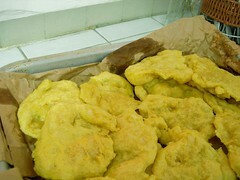 thank you the recipe for the doubles!!! Hey Rene – I have to get working on some chutney recipes…although the “pepper” ones usually have mango or something in them as a base sometimes, otherwise it would just be pepper sauce – I will investigate and try to put up some recipes! I want to try this. I[‘m not Trini but I’ve been there a few times to visit friends and I became ADDICTED to the place: the people, the beaches, THE FOOD. I love doubles and pastellles, especially. Not too fond of roti because of the bones, but eh. However, i find one thing missing from your recipe—mango chutney! How do you make it? Hi Tiffany. Good luck with the recipe! As for the mango chutney, I have never actually made it myself, but you have to get green mangoes and boil them and stuff. Very specific I know…I’ll have to get more details from Mom. I think the last time I tried to make doubles I used the recipe from the Naparima cookbook..or maybe it was TriniGourmet’s recipe. I can’t remember and can’t find the Naps cookbook now, so I am using TriniGourmet’s recipe this time around… The point is though, that last time I was unable to get the dough to rise and as a result, the bara came out a little stiff. I notice in your recipe you use baking powder as well as yeast. Approximately how long did it take for your dough to rise/double using both yeast and baking powder? Hi L – well, checking with my mother, the provider of this recipe – the dough takes only 20-30 minutes to rise, but that’s for the humid tropics. If you’re up North, you may need to leave it to rise for at least an hour. Mom suggests that you use lukewarm water to make the dough, and that may help. Mmmmmm I trying this today for sure! Havent eaten doubles for over 2 years wish me luck!! Hello! I just wanted to say your recipe for doubles are spot on! I am an African-American and I had the pleasure of working in a Trini bakery for a couple years in south FL. We served food there as well. Needless to say, over the years I have become a double-eating, mauby-drinking, pelau-making Trini foodie lol! I halved the recipe because it only my son and I. They were great! We live in New Mexico now so we are….deprived. Do you mind posting a recipe for mauby? I seem to be doing something wrong…I still drink it anyway! I’m so glad I found your blog! Thanks! Hi Jennifer – thanks so much! glad the recipe worked out I’ve been to a few places selling doubles in South Florida, wonder if I’ve passed through that one!